An interdisciplinary examination of how trace elements behave in the environment and how they interact with human biochemistry. This volume takes a similar format to previous publications by Alina Kabata-Pendias, author of ‘Trace Elements in Soils and Plants’, now a reference point of choice for introductory material on trace element biogeochemistry in the terrestrial environment. This is not the sort of book that one reads from cover to cover. Rather, it is a useful place to gain background information on an element that can be used as a starting point to guide further exploration. This is particularly useful for a student or researcher embarking on a new project. In this spirit, I dipped into a few chapters to learn more about a few elements that I am unfamiliar with, to find out about their behaviour in the environment, and their role in human physiology. The chapter on gallium begins by outlining how gallium is chemically similar to aluminium and is thus produced mainly as a by-product from bauxite mining. Due to its low melting temperature (~30 °C), it is used to make low melting point alloys (e.g. as a replacement for mercury in a thermometer). It is relatively stable in soils, a property that makes it a good marker for the characterisation of soil pedogenesis. Although not an essential element, there is some evidence for it being beneficial in some microorganisms, particularly fungi. Radioactive gallium-67 salts (e.g. gallium citrate) can be injected intravenously – whereby they dissociate into Ga3+ ions – which are then used for medical diagnostics. Rhodium, the least abundant of the platinum group elements, is primarily used as an alloying agent with platinum and palladium in catalytic converters. Due to its extensive use in the automobile industry, rhodium concentrations in urban and roadside soils are slowly increasing. Rhodium is not known to play any biological role or to be particularly toxic. However, due to its increasing abundance in the environment, there is considerable interest in quantifying human exposure from the ingestion of food contaminated by aerial deposition. The chapter on yttrium starts by comparing it with the lanthanides, and remarks that it is often classified as a ‘rare earth element’ due to its chemical similarity. 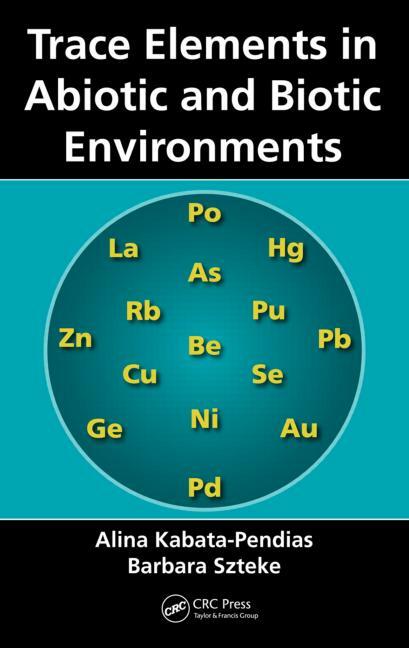 It is found in the 3+ oxidation state in uranium or rare earth element ores, and used (as Y2O3) for luminescence or semiconductor materials in electronic devices. Environmentally, yttrium is found in greater concentrations in mosses and lichens than vascular plants, indicating that atmospheric deposition is its main source. Similar concentrations in Poland and Alaska imply that yttrium is globally well-mixed in the atmosphere, rather than deposited close to emission sources. It is not known to play any biological role and is considered mildly toxic because it can cause lung disease if inhaled in large quantities. The mechanisms of toxicity include enzyme inhibition and substitution for essential elements, resulting in imbalance. A radioisotope of yttrium, yttrium-90, is used in radioimmunotherapy drugs for the treatment of various cancers, including leukaemia and lymphoma. Overall, ‘Trace Elements in Abiotic and Biotic Environments’ provides a large breadth of information for the environmental scientist or (eco)toxicologist and is an excellent starting point for anyone wanting to know a little more about some of the more exotic trace elements. In my view, it is missing an introduction and/or conclusion which could serve to bring together the information and define its scope, or to highlight opportunities to drive forward the future of the discipline. Kabata-Pendias, A. and Szteke, B. (2015) Trace Elements in Abiotic and Biotic Environments. CRC Press, Boca Raton, FL, USA.